"The idea is to have a support system for undocumented students," says Madrigal, a senior Chicano and Latino studies major who created the DREAMers Club as a resource for undocumented students at Sonoma State. "As a first generation, low-income student, I feel it would be difficult to get through college without a mentor or safe space." Under the California DREAM Act, undocumented students in California are able to receive state financial aid to offset the cost of an education, allowing more students to attend college. Though for many students, just completing the DREAM Act application is difficult and tedious. Madrigal says the club is a resource for students struggling with financial aid under the DREAM Act. "These students have been in the United States for the majority of their lives," says DREAMers Club adviser Mariana Garcia Martinez. "A lot of them came in their childhood, and do not know any country other than the U.S."
Madrigal and the DREAMers Club are working to bring a Dream Resource Center to Sonoma State. "We've seen a lot of dream centers being created across the California State University and University of California and we think Sonoma State should have one as well," says Madrigal. Santa Rosa Junior College opened its own Dream Center in May to assist the campus' undocumented student population. Madrigal, who transferred to Sonoma State from SRJC, believes Sonoma State students would significantly benefit from a similar center. "In my major, I would be lost without my academic adviser," says Madrigal. "Students need that mentorship and advising and a resource center would provide that." Last month, the U.S. Department of Education released a resource guide to assist schools and community leaders in supporting undocumented students. Madrigal believes this guide is a step forward for undocumented students and shows the increasing need for resources like a Dream Center. 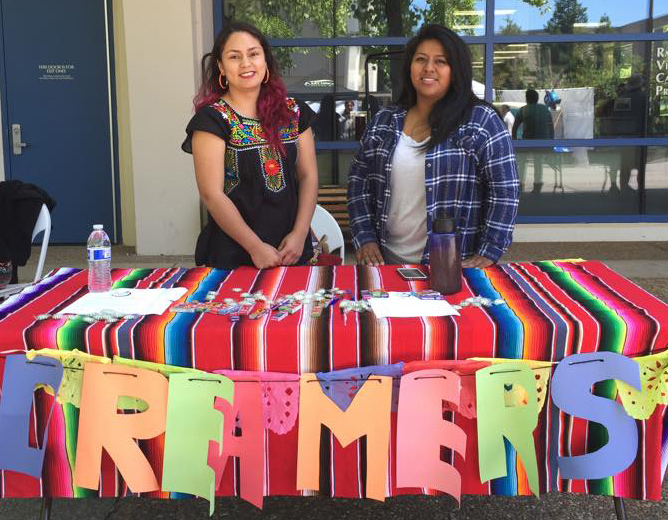 In September, Sonoma State hosted its first annual DREAMer Conference, featuring DREAM Act researcher and Claremont University Ph. D. candidate Iliana Perez, who spoke of her struggles pursuing higher education after coming to the United States at the age of 8 from Mexico. Members of the club have been working with undocumented high school students in Sonoma County and encouraging those students to form educational goals, despite being undocumented. "I work at Healdsburg High School and I brought some of my students to the DREAMer Conference and they left with such a sense of empowerment," says Madrigal. "Now we've created a DREAMers Club at their high school." Many of the undocumented high school students the club works with are now applying to college. The club encourages those students to persevere when it comes to their college aspirations. "College can be difficult for someone with citizenship, but it's 10 times harder for undocumented students," says Madrigal. "So that's what we're trying to help these high school students with, applying to college while being undocumented." The DREAMers Club meets every Monday from 12:30 p.m.-1:30 p.m. at the HUB on the second floor of the Student Center. The DREAMers Club invites DREAMers and Allies to take the pledge to participate in the 3rd annual National Educators Coming Out Day on Nov. 12. Here's how it works: After taking the pledge to support and work with undocumented students, follow the emailed instructions on how to take action on social media. From sharing a selfie holding an "I stand with and for undocumented students!" poster to creating a short video, participants are advocating for the increase in resources and access for undocumented immigrant students in education.